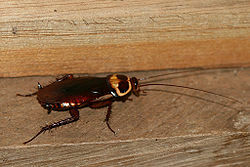 The American Cockroach is a species of cockroach, known by the binomial name of Periplaneta americana. In America, it is almost the first thing people think of when they hear the word pest. They live in sewers, and they are commonly seen scurrying about in dark alleys in the city. People only hate them because they live in the dark. They can't hurt you in almost any way. The American Cockroach, or P. americana, is the largest and most widespread of all North American cockroaches, the biggest reaching 44mm in length. It is usually dark reddish brown with a pale peripheral band around the pronotum. Most adults of this species have large wings, but do not often choose to fly. The nymphs of this species are wingless. The body is divided into the head, thorax, and abdomen. The head is inconspicuous when looked at from above, but the thorax a much larger. Most of the thorax and the entire abdomen are hidden by their wings. They have six pairs of similar, strong, spiny legs. You can see very little of the head from the dorsal view, but when you flip the species onto its ventral surface, you get a clear view of the head. The head is flattened and more or less pear shaped with mouth parts extending from the narrow end of the head. This species has unspecialized mouth parts, used for only biting and chewing. The head can be retracted beneath the prothorax. The thorax is specialized for locomotion and bears three pairs of legs and, in adults, two pairs of wings and contains the muscles to operate them. It is the middle part of the body and consists of the anterior prothorax, middle mesothorax, and posterior metathorax. The prothorax is the only part that is able to be seen from the dorsal view. In ventral view they can all be easily seen and recognized by the pair of walking legs attached to each. The abdomen is the largest of the three parts. Its segmentation is conspicuous dorsally and ventrally once the wings have been removed. The abdomen has 11 segments of which the 11th is reduced and fused with the 10th so that a maximum of ten segments are distinct and visible. Some of the segments, especially in females, are modified or in unexpected locations and are not immediately visible and countable. Before mating, P. americana engage in courtship rituals. Female will first lift their wings, exposing their intertergal membranes, expanding their genital chambers, and sending out a pheromone to attract a mate. This is known as their calling position. Males that are attracted flap their wings to denote interest. Mating begins when the male backs into the female and deposits sperm. After fertilization has occurred, the female produce an egg case also called the ootheca. The female carries the egg case with her for a time, usually 1-2 days, and then deposits it in a warm, humid place. Nymphs emerge within 38 days, and fully develop in 6 months to a year. The full life span of P. americana is between 1-1.5 years. An American cockroach eating some meat soup. P. americana is an opportunistic omnivore. It usually consumes decaying matter, but it will scavenge anything. It prefers sweets, but has been observed eating such things as paper, boots, hair, bread, fruit, book bindings, fish, peanuts, old rice, putrid sake, the soft part on the inside of animal hides, cloth and dead insects. American cockroaches have come to be a public health problem, mainly due to their association with human waste and diseases, and their vast numbers. In the United States in summer, they may over run alleyways and yards. 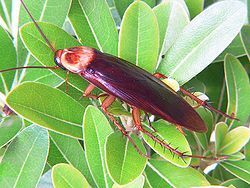 The American cockroach is normally found in caves, mines, privies, latrines, cesspools, sewers, sewage treatment plants, and dumps. Their presence in these areas has become an epidemic. At least 22 species of pathogenic bacteria, virus, fungi, and protozoans, as well as five species of helminthic worms, have been found in field collected cockroaches. They also tend to ruin things by soiling them with their excrement and regurgitation. You may have heard the theory that cockroaches can survive massive doses of radiation, such as a nuclear bomb. These are completely false. In all the tests conducted on insects, cockroaches were deemed weakest to radiation. A dose of 6,400 Rads killed 93% of cockroaches in one study, while most other insects were unaffected at doses ranging between 48,000 and 68,000 Rads. This would only give cockroaches a 6-15 times better immunity than a human. Another test showed that P. americana would be killed at 68,500 rems (different way of measuring radiation than Rads), while the German cockroach would be killed at 90,000 rems or higher. Therefore, cockroaches may be considered a "wimp" in radiation tolerance. Species Periplaneta americana - American Cockroach by Bugguide. Iowa State University Entomology. Invertabrate Anatomy online - Periplaneta americana Richard Fox, Lander University, June 30, 2006. Featured Creatures Kathryn A. Barbara, University of Florida, June 2000. Cockroaches and Radiation By Karl S. Kruszelnicki, ABC Science, February 23, 2006. This page was last modified on 2 December 2013, at 12:54.